Seats are limited, on a first-come-first-served basis at the door. Drama Box is celebrating its 25th anniversary with a festival on Forum Theatre, one of the most important forms used by Drama Box. 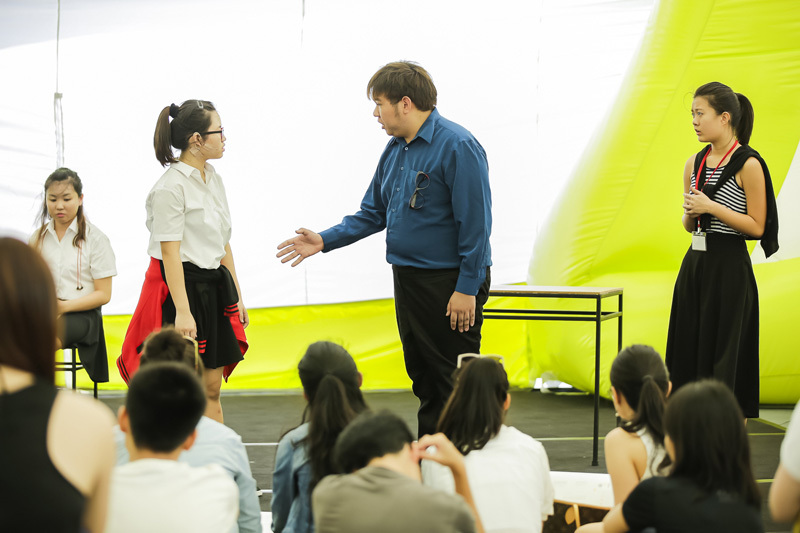 SCENES: FORUM THEATRE is a consolidation of Drama Box's work and beliefs from the beginning. 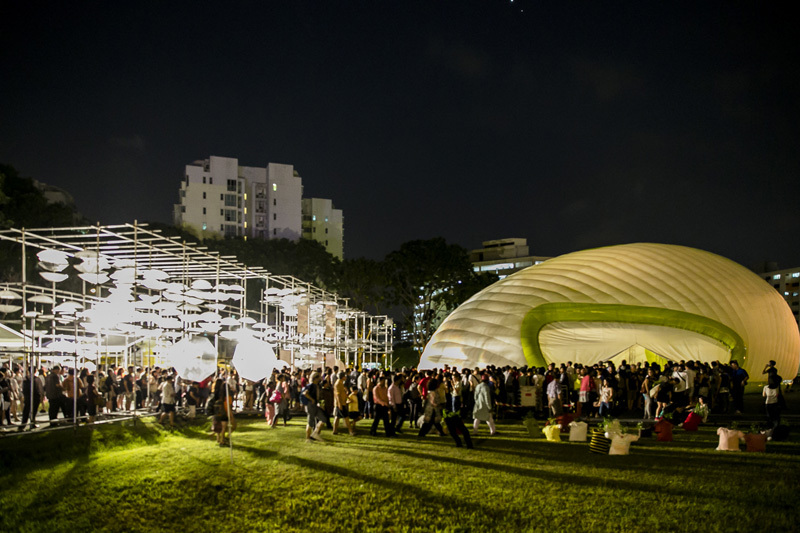 This is a major milestone for us, and is especially significant is that SCENES should be the official launch programme for GoLi – The Moving Theatre, the FIRST inflatable theatre in Singapore. GoLi is symbolic of a ground-up approach to our work in the community and our commitment to bringing people together through socially engaged art. 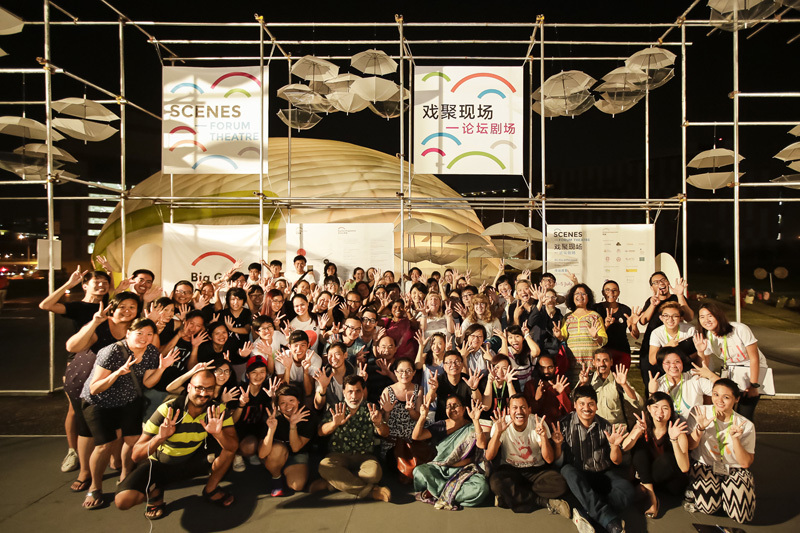 As Forum Theatre multiplies and takes flight in Singapore, for the first time, professional arts groups from different parts of the world stage their Forum Theatre performances alongside Drama Box, for the audience in Singapore. What are the aesthetic possibilities of Forum Theatre? What do the works reveal about the concerns of their places of origin, and how do they impact their social environment? A MRT train travelling towards the north stops suddenly and five passengers of different races are trapped inside. One of them receives an SMS stating that there are rumours about a bomb. Everyone panicks and gets suspicious. Trick or Threat! was created in 2007, after the September 11 attacks. It was created from a deep-seated concern about the ability of Singaporeans in dealing with racial tensions when faced with the threat of terrorism. 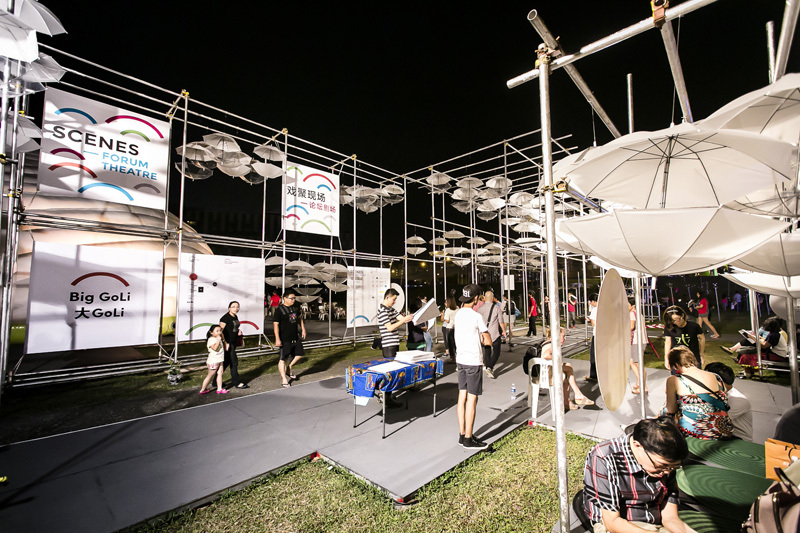 It was denied an outdoor performance license just days before its slated performance, and had to be staged inside a tent. 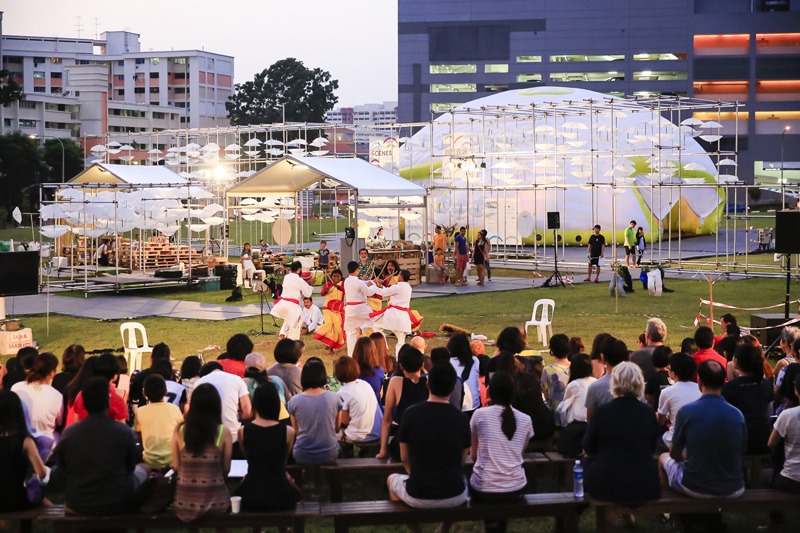 Nonetheless, it has since become Drama Box's longest-running show, and was even commissioned by People's Association as part of their community engagement programme for grassroots leaders and community partners. Real Voices Real Lives is an interactive theatre workshop that explores disability harassment, including "mate crime", "hate crime" and violence, in a supported environment. 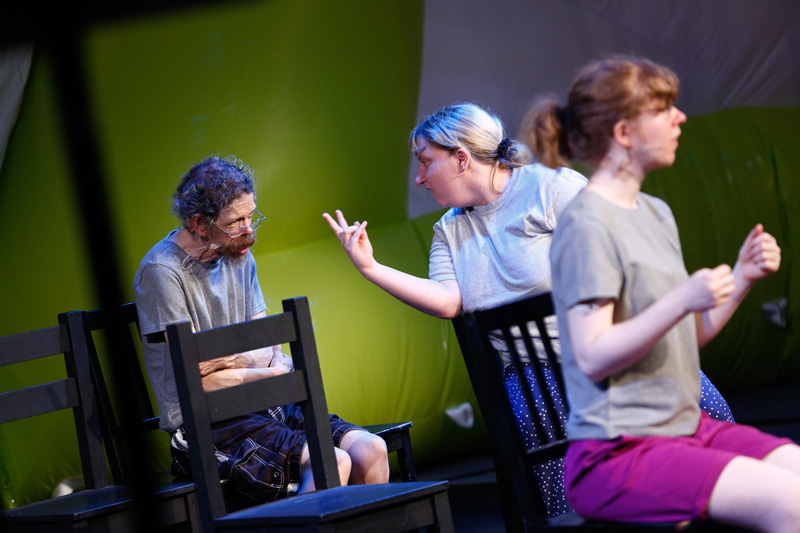 It offers a unique opportunity to participate in training delivered by professional learning-disabled actors who also have direct experience of the issues explored. Professional learning-disabled actors present RVRL through a series of short performances, providing learning through participation, discussion, interactive role-playing and sharing of experiences. The aim is to present the issues and help participants think about what they can do to make a difference – in their own lives and in others. Xingzhen is a middle-aged woman who has returned to the workforce. She is a dispatched labour worker who wishes to become a regular employed staff. This however attracts hostility from her colleagues who are regular employees, worried she would take their place. This puts her under immense pressure but she soon finds out that fellow dispatched labour Uncle Kun, is in a worse situation, and the schooling of his two children might be affected. Xingzhen tries to help Uncle Kun by approaching the management, but gets nowhere with her two bosses. This endangers her chance to become a regular staff. Just then, an accident occurs, exposing the hypocrisy of her employers and the oppression of the system of dispatched labour. When an employee has two employers, will he enjoy more benefits and security? Or will he face even more unequal treatment? In the face of global competition, enterprises seek to drive down costs and increase profits, thus introducing to the workplace contract employment, unpaid leave, employee accountability, dispatched labour, etc. The implementation of these has greatly impacted employment rights. Dispatched labours not only draw low salaries, but also enjoy poor benefits and zero job security. They often face discrimination and are treated like second-class citizens in the workplace. In Taiwan, besides in private enterprises, dispatched labour workers make up the majority of even public institutions like television stations, the education ministry and labour ministry. 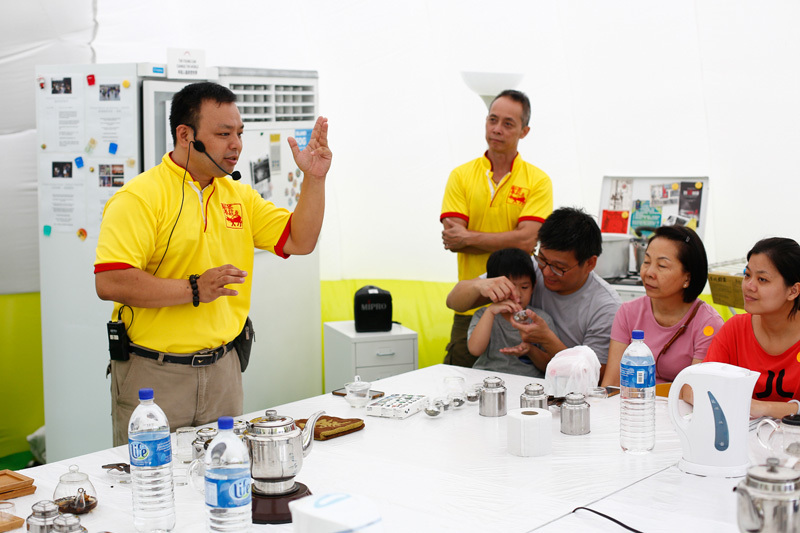 According to statistics, Taiwanese has up to half a million of dispatched labours in 2013. Thus One Employee, Two Bosses was created to raise the awareness and critique of the public on the system of dispatched labour. The play tells the story of a girl being forced to marry at an early age. Her father would rather sell his cultivable land for her dowry, than to let her attend school. The father makes all the decisions and imposes them on his wife and daughter. What is life like for women before, during and after marriage? How are men's attitudes towards women shaped in a patriarchal society? This play evolved from Jana Sanskriti's workshop with a group of women from some of the villages in West Bengal. It was first staged in 1991 and has since been performed over 2,500 times across India and the rest of the world, by all the teams of Jana Sanskriti over the last 24 years. The forum discussions of the play have been enlightening irrespective of geography. The Young Can Change the World was created to encourage critical thinking and constructive dialogue among the youths about social issues through the use of Forum Theatre, and thereafter, be inspired to take positive social action and become the change they want to see in the community. Community Theatre Training Programme was meant to equip participants, regardless of whether they came from a theatre background, with the the knowledge, skills and ethical awareness important to this form. 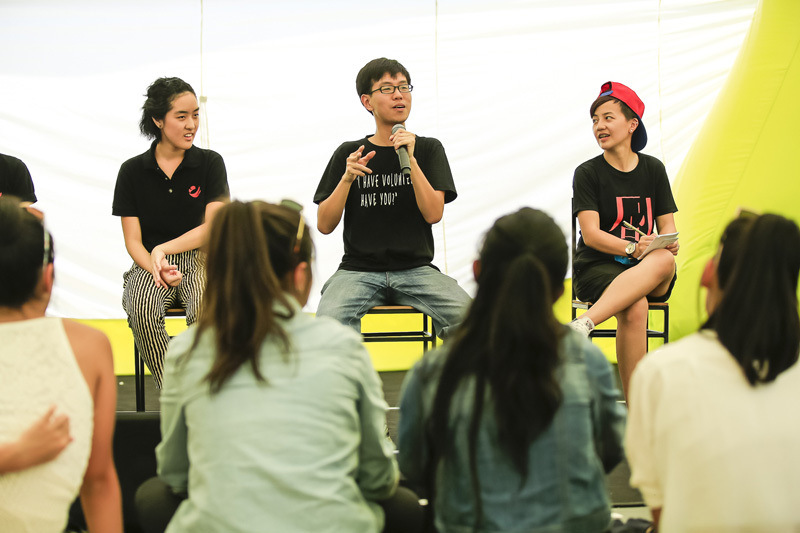 The showcase of their Forum Theatre pieces serves as a platform to raise awareness on the issues faced by different marginalised communities in Singapore. This workshop is for anyone interested to find out more about Forum Theatre, especially Drama Box's brand of Forum Theatre, developed through 15 years of community theatre work. It combines Brazilian theatre legend Augusto Boal's Theatre of the Oppressed and David Diamond's Theatre for Living. This short immersion course introduces participants to Drama Box's pedagogy, the art of creating Forum Theatre, as well as the theories behind Forum Theatre and Theatre of the Oppressed. Back by popular demand! Bárbara Santos, the protégé of Augusto Boal, is back again, after a much raved about workshop in 2011. The Aesthetics of the Oppressed is based on three elements: image, word and sound. This workshop aims to develop sound and rhythm in Theatre of the Oppressed scenes and plays. The sound of the voice and the body, the sound of objects and their possible combinations, the rhythm of the created sounds, the rhythm of the characters, the rhythm of the play, the rhythm of the forum and rhythm as dialogue. This experience promotes a collective investigation about the possibilities of rhythmical expression of daily-life oppressions. How to associate rhythm, image and movement in a sonorous composition that allows communicating a story? How could this composition allow forum? This workshop is the result of collaboration between Bárbara Santos and Till Baumann from KURINGA (Berlin), who began the experience as a theatrical laboratory in Berlin and developed it in a sequence of several workshops in Croatia, Guatemala, Colombia, Germany and Brazil. The initiative is part of the KURINGA Theatre of the Oppressed Qualification Programme. The workshop also looks at how Rainbow of Desire can help Jokers in preparing and conducting their Forum Theatre performances. Please produce a copy of your student ID upon registration to enjoy the discount. Please produce a copy of the official receipt upon registration to enjoy the discount. Please produce a copy of your membership card upon registration to enjoy the discount. If you're interested to participate in the above workshops, please email your name, contact information and relevant experience (for Breaking the Silence – Level 3) to josephine@dramabox.org. Join a panel of local and international practitioners in a discussion about the future of Theatre of the Oppressed and its role in effecting socio-political change. What are the roles of artists? How to create sustainable movements in engagement with the communities? 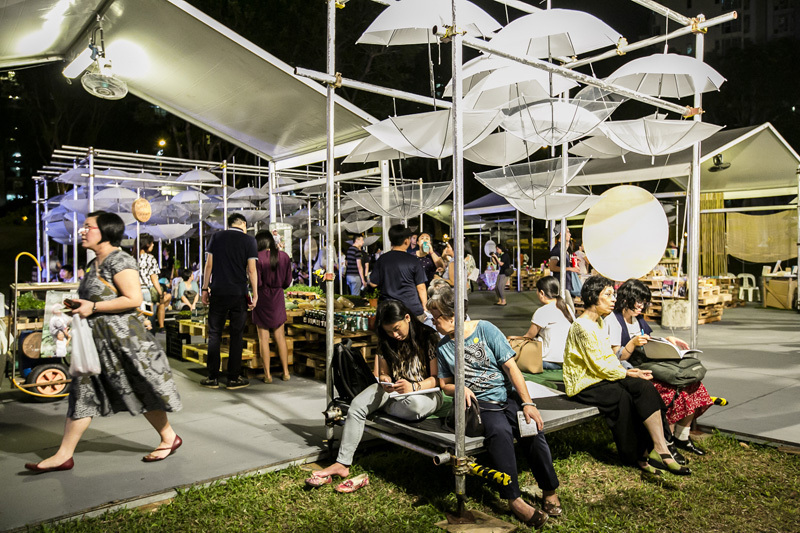 This is a space for young people living in Singapore to gather and share about their experiences, ideals and aspirations on social engagement. 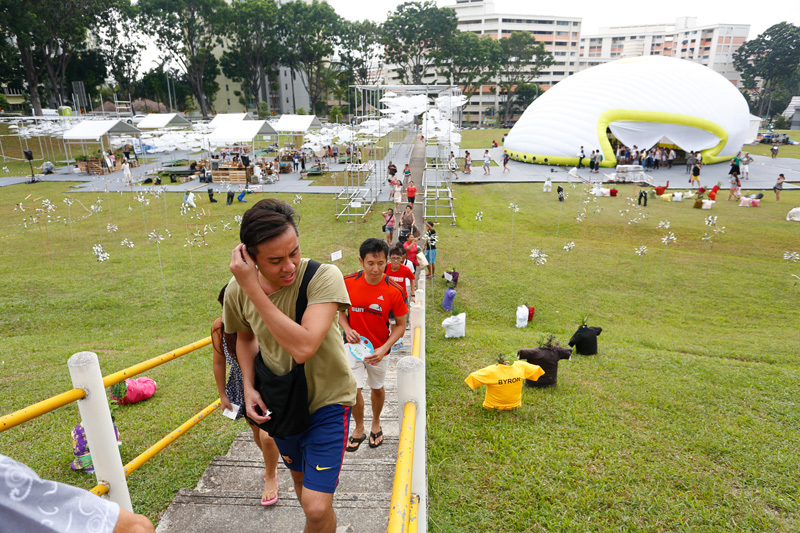 What roles can the youths play in engaging communities and society? Besides using the arts, in what other ways can we respond to the issues we see around us? 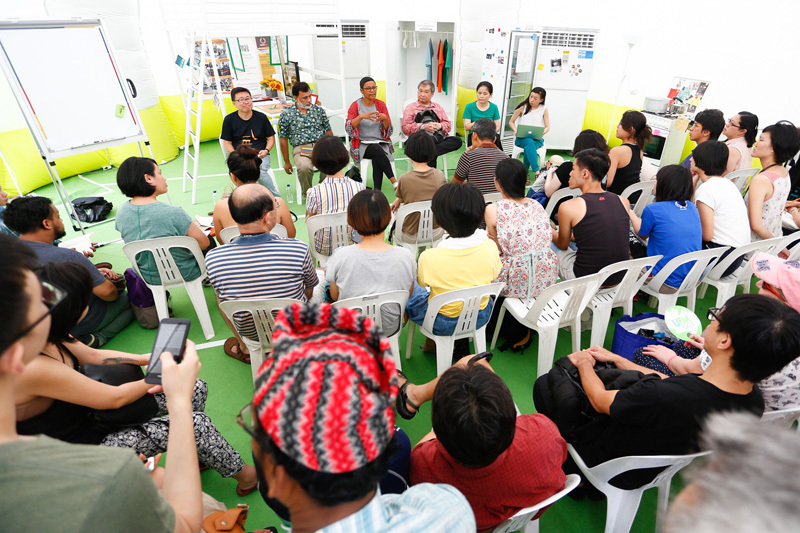 In this space, we invite non-arts groups with a unique vision in filling the gaps they see in society and that have been working on their social causes, to table their ideas. Find a moment to relax in playGROUND, visit the groups and if you see a cause that you agree with, support them! 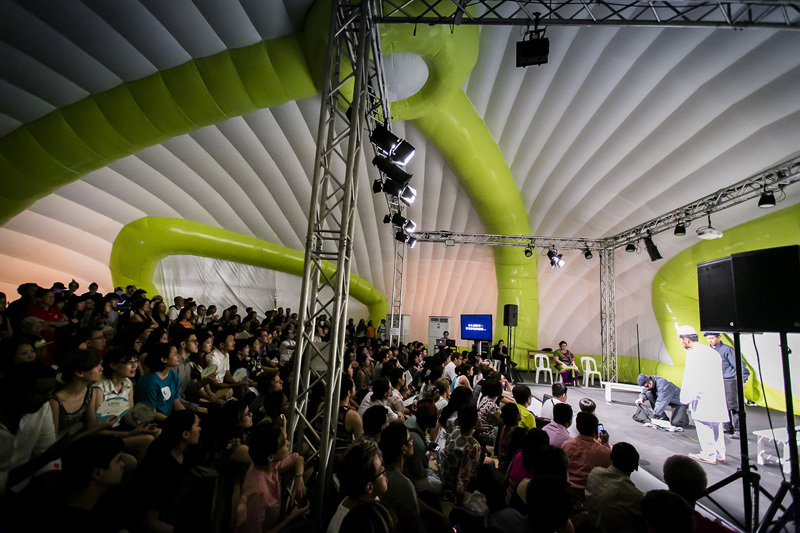 Forum Theatre is part of the arsenal of Theatre of the Oppressed, established by Brazilian theatre master Augusto Boal. With the concept of Oppression (or liberating the "Oppressed") central in the work, the most distinct feature of Forum Theatre is that it turns passive spectators to become proactive "spect-actors", by allowing them onstage to replace actors and change the outcome of a play. 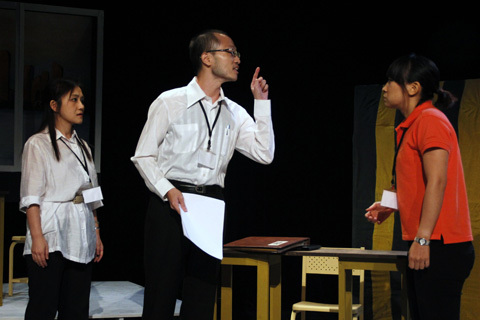 Drama Box is one of the forerunners in Forum Theatre in Singapore. For more than a decade, we have worked with many organizations and created numerous Forum Theatre performances tackling issues such as domestic violence, out-of-school youth, problem gambling, racial harmony & terrorism, elderly etc. We also conduct the workshop Breaking The Silence annually to train practitioners who are interested to use Forum Theatre in their works with the community. Watch Drama Box's Forum Theatre performances and how some of the audience members chose to participate. Sanjoy Ganguly was active in Communist politics as a student. Disillusioned by its centralist tendencies, he left the party in search for a political culture of dialogue and democracy. He began working in the theatre in rural Bengal in the early 1980s. His encounter several years later with Augusto Boal and the Theatre of the Oppressed, couple with his own passionate commitment to the creation of a more just and equal society, led him to found Jana Sanskriti, an independent organisation committed to the use of theatre to conscientise and empower the communities it serves. With more than thirty active theatre groups associated with the group, Jana Sanskriti is now the largest organisation of its kind in India. 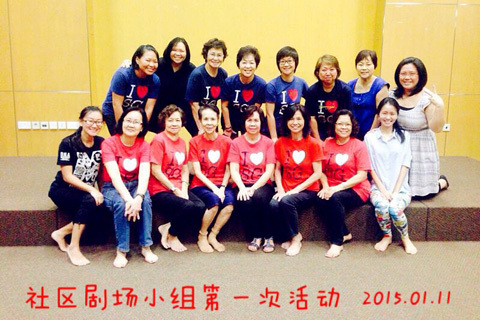 Lai Shuya has been practising People's Theatre in Taiwan for more than 20 years, using theatre to empower, train and educate community residents by working closely with many local and overseas non-profit organisations and community groups. 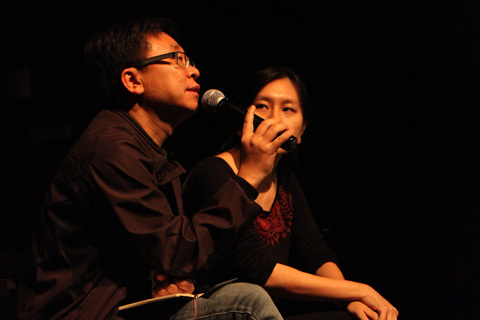 In 2006, Shuya founded Centre for Applied Theatre, Taiwan, a major non-governmental organisation that promotes the development of Community Theatre and works closely with the Cultural Affairs Bureau of each county and The Council of Cultural Affairs, Taiwan. 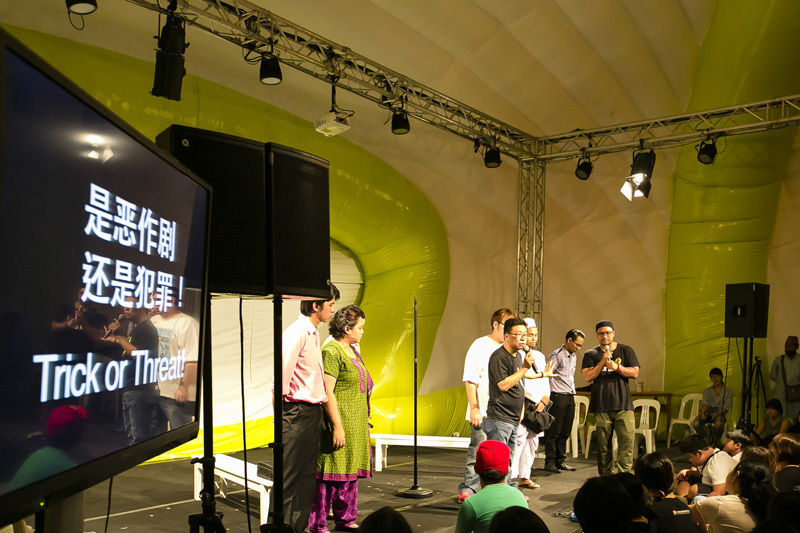 In 2011, she introduced the first Forum Theatre performance to Taiwan, engaging the audience to dialogue about social and public issues, and empowering individuals to take action to make changes in their communities. Whether it is through People's Theatre and Community Theatre workshops or Forum Theatre performances, she continues to expand the possibilities of engagement and dialogue by marrying theatre and work in the communities. Joyce Ngayu Lee is a theatre maker based in the United Kingdom. 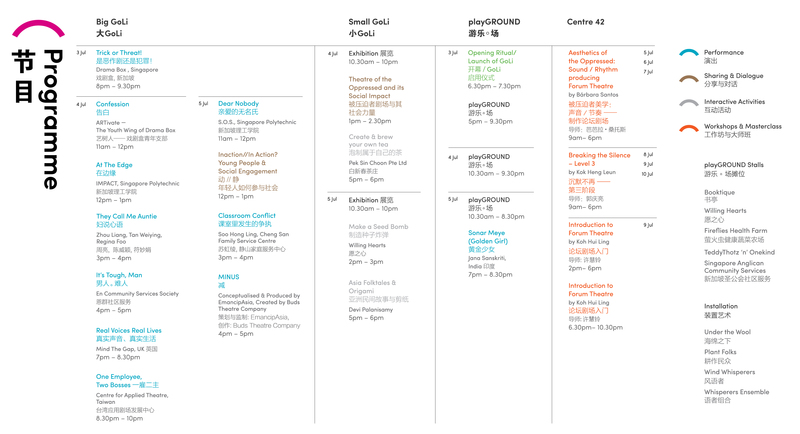 Joyce has been a core member of the progressive theatre company FM Theatre Power (Hong Kong) since 2003, engaging in political theatre and Theatre of the Oppressed, creating work for a variety of settings ranging from traditional mid-scale theatres, forum theatres, to guerrilla street theatres. Primarily a director and performer, Joyce is also an educator and facilitator. 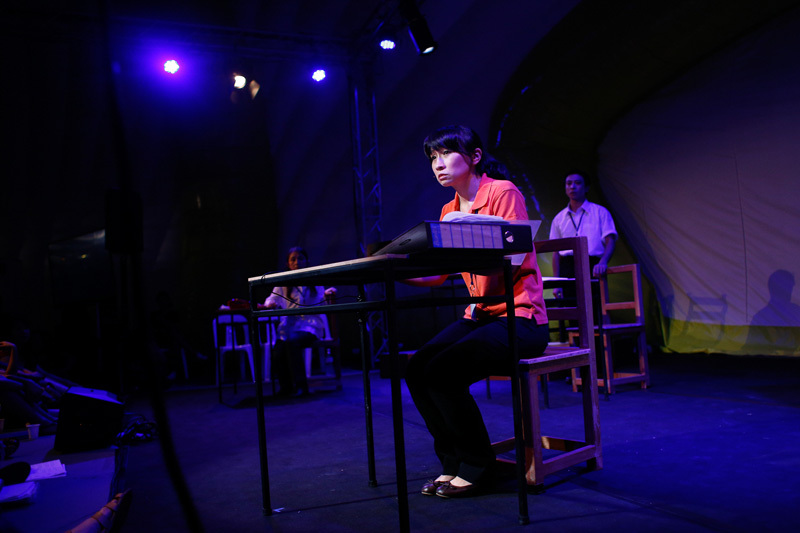 After obtaining MA in Theatre Making from the University of Leeds, Joyce joined Mind the Gap (UK) and worked with artists with and without disabilities internationally, including Ireland, France, Sweden, China, Hong Kong, Germany and Switzerland. Apart from Theatre of the Oppressed, Joyce's work with Mind the Gap also covers arts on digital platforms (Sonic Maze 2010) and large scale site sensitive performances (Irresistible, 2010, Gift, 2014 & Trickster, 2014). She is now Resident Director of Mind the Gap. 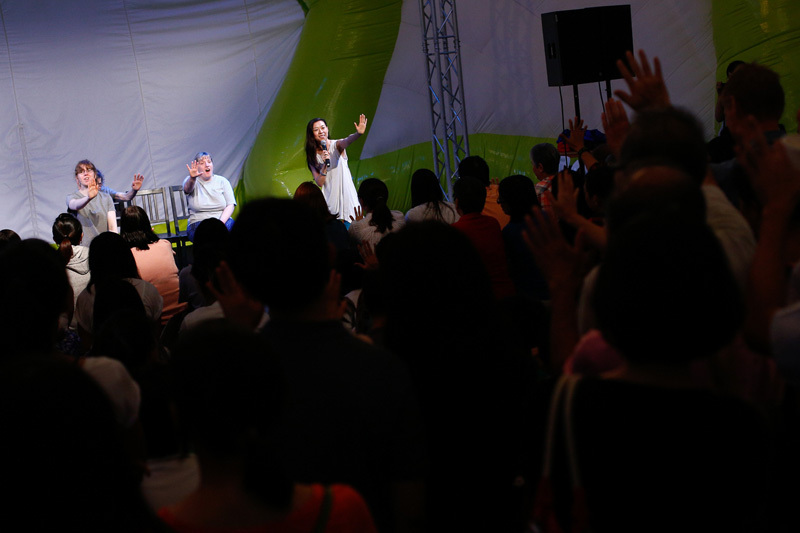 Coordinator of the Centro de Teatro do Oprimido CTO (Brazil) 1994 – 2008. Worked with Augusto Boal for two decades in artistic productions and theatre techniques such as Legislative Theatre and Aesthetics of the Oppressed. Bárbara Santos develops Madalena Laboratory – innovative aesthetic experience about the specific oppressions that women face in diverse contexts. She is the artistic director of KURINGA (Berlin) and editor of the magazine Metaxis (Brazil).